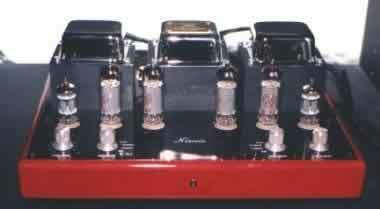 The Nimis is the smaller integrated made by Synthesis and it is one of the most affordable tube amps available in the market (here in Italy, at least). This amp is a beauty: smallish (32 x 22 x 12 cm), carefully finished and crafted, this shiny integrated does have a very high WAF factor! In the rear panel we also find the on/off switch and the IEC mains socket, plus four gold plated output posts. On the front panel, besides the metal grid that avoids unwanted and potentially dangerous "contacts" with the hot power tubes, we can find double volume controls and double input selectors (YES!!!) 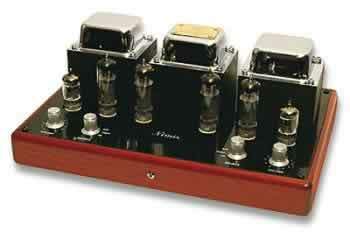 since the amplifier is entirely DUAL mono. I must admit this is one of the coolest looking HiFi components I've ever seen (pictures are never enough...). 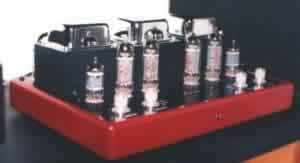 The amp uses a pair of 12AU7 tubes and a pair of 6BQ5 (in pentode configuration) for the power stages which deliver 15 watts @ 6 Ohm. 3 line inputs + 1 one tape loop is all what you get in the inputs department. While very small the Nimis is pretty heavy, weighing in an impressive 10 Kgs (23 lbs). The Nimis was not designed to remain hidden somewhere into an ugly black anonymous HiFi rack: place it so that everyone can see it...on top of an elegant rack, for example, so that it doesn't overheat. The double input selector (one per channel) and the double volume pot, though very "audiophile", are pretty uncomfy to use...as is the on/off switch placed on the rear panel, especially if you listen to the amp without the grid....ouch! The loudspeakers output post are very easy to use and offer a good "grip" to the fingers. The Nimis has started to show it's personality just after 50 hours of break-in...before it's sound was confused and pretty unstable (changing day by day). First of all let me remind you we're talking of a cheap tube integrated amp here, maybe one of the cheapest around (at least, as I said, here in Italy), especially considering the very high quality of the finish. The tonal balance is on the soft and warm side though the highs slightly prevail over the mid range, so that the sound sometimes appear a bit on the thin side. The mids are "fluid" and "liquid" but also light and hence the female voices sound thin and so the violins and cymbals. The same applies to male voices and choirs. You can't find full-bodied and hyper-detailed sound in cheap amplifiers and so this Nimis makes no exception to this rule, sounding smooth, never particularly introspective or "solid". The Nimis is never dynamically explosive also, since it prefers to sound "fluid" and quite relaxing. The Music flows through it like water in a large and quiet river. Either you love or hate it: if you fall in love with it you'll be able to forgive some indecision on the mid-bass, especially when it can't properly control large woofers. You will also be able to enjoy a small and coherent soundstage where contours appear "blurred" and extra-smooth...no hyper-definition allowed here, thanks. It's driving ability is adequate with standard easy loudspeakers into mid-sized listening rooms. Well, it is clear that this amp does have some limitation though I think it should be thought as a small, smooth tube amp, born to play Music into a relaxed environment, hence common audiophile "figures" need not to apply here. Either you love or hate it. For example, I've hated the double controls (both input selector and volume) since they make adjiusting the correct balance between left and right channel a real pain in the neck. Choose carefully your loudspeakers: they should be an eaaaasy load, with a warm and solid mid range, a controlled and fast bass and a detailed high range. As for cables: for example, a strongly recommended choice would be a pair of our TNT FFRC's, which have a very good and clean mid range. Also, a good match would be the Marantz CD 67 CD player, for example. If these "qualities" don't suit your needs...look elsewhere! A warm thank you to Luigi Lorenzon of Synthesis - Art in Music for having sent us the Nimis for reviewing.